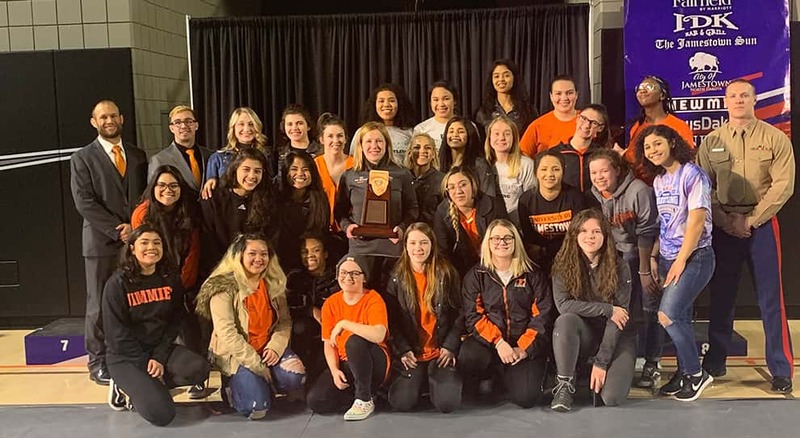 JAMESTOWN, N.D. (Jimmie Athletics) – The University of Jamestown women’s wrestling team placed third out of 20 teams Saturday at the first-ever NAIA Women’s Wrestling Invitational, held at Harold Newman Arena. Ten Jimmies finished in the top eight of their respective weight classes. Places one through four were named All-American while places five through eight earned honorable mention All-American. Cara Romeike (SR/Coppell, Texas) was the highest-placing Jimmie on Saturday, taking second at 130 pounds. She won her first two matches by tech fall before pinning Julissa Taitano of Southern Oregon in the semifinals. Romeike was pinned by Andribeth Rivera of Campbellsville University in the final. Junnette Caldera (FR/Imperial, Calif.) was third at 101 pounds. She pinned Hiba Salem of Menlo College 30 seconds into the second period in the third-place match. All four of Caldera’s victories came via pin. Also finishing third was Myranda Velazquez (JR/Los Banos, CA) at 155 pounds. Velazquez lost her opening bout of the day but responded with five straight wins, including two pins and two tech falls. Agatha Andrews (FR/Akiak, Alaska) won all three of her matches at 191 pounds via pin and placed fourth. Andrews lost a tough 6-5 decision to Leilani Carmago-Naone of Midland in the third place match. Seventh place finishes went to Chelsea Dionisio (SR/Santa Maria, Calif.) (116), Arianna Marrufo (FR/Dos Palos, Calif.) (123), Jamayia Blackston (FR/Lakewood, Wash.) (116), Joy Muniz (JR/San Diego, Calif.) (143), and Sierra Talmadge (SO/Bismarck, N.D.) (155). Alyssa Schrull (JR/East Helena, Mont.) (170) took eighth. In the team race, the Jimmies finished with 137.5 points, behind only Menlo College (230.5) and Oklahoma City University (154.5). UJ was selected by a vote of the coaches as the winner of the Sportsmanship Award.